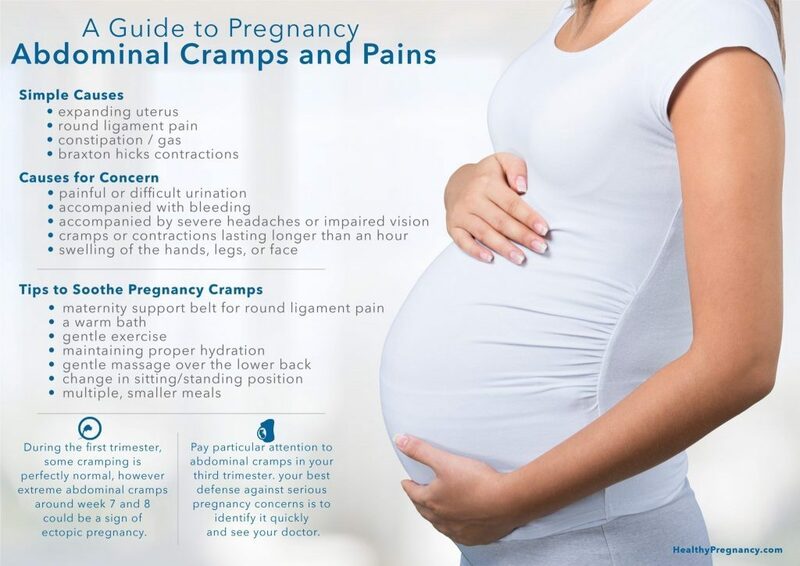 Cramps during your pregnancy can be frightening, especially for first-time moms. While there are times when these cramps can be cause for concern, many times they are simply a side effect of your growing baby. By the first couple months into your pregnancy, you have become aware that aches and pains are common. Your body is stretching, shifting and growing to accommodate your baby as it grows inside you. Some aches and pains, however, can be frightening, especially if you fear that they might impact your baby. If you’re pregnant and suffering from abdominal cramps, this handy guide will help you tell the difference between normal stretching and pain that signals it may be time to call your doctor. 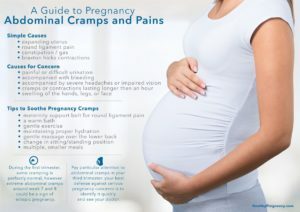 During the first trimester, some cramping is perfectly normal. In fact, for many moms, the first sign that they’re pregnant is cramping that isn’t accompanied by the usual start of their period. While these cramps are a normal part of the pregnancy process, during the first trimester you should contact your doctor if you experience any of the following circumstances. Cramping occurs after the first six weeks but before week 12. You’re experiencing sharp pain accompanied by bleeding. You’re experiencing extreme swelling in your hands and feet. You have a severe headache accompanying your cramps, especially if it’s impacting your vision. Keep in mind that if you haven’t had your pregnancy confirmed by ultrasound and you experience extreme abdominal cramps around week 7–8, you could be experiencing an ectopic pregnancy. If you feel that this may be the case, you need to contact your doctor immediately, as this is considered a medical emergency. Cramping that signifies a miscarriage should also receive medical attention. During the second trimester, some cramps and discomfort in your abdominal area become more normal. Round ligament stretching is extremely uncomfortable for some women, who often describe it as a sharp, stabbing pain. The best remedy for this pain is to change position, stop moving if you’ve been extremely active or get up and move around for a little while if you’ve been stationary. Some pregnant women also choose to use a maternity support belt to help with round ligament pain. Later in your second trimester, you may begin experiencing Braxton Hicks contractions. Some women barely notice the tightening of their uterus as it prepares for labor and the act of bringing baby into the world. Other women may notice Braxton Hicks contractions immediately and experience them as cramps or sharper pains. If you notice them growing in intensity, change position: from sitting to standing or lying, from lying to walking around. Many women find that a warm shower can help put a stop to Braxton Hicks contractions. Drinking plenty of water can also help increase your overall hydration and reduce Braxton Hicks contractions. As your baby grows, you may also find that constipation and gas cause a substantial increase in the amount of abdominal cramps you experience. The increased pressure of your uterus on your bowels, stomach and more can make it more difficult to enjoy a full meal. Try to identify the foods that cause painful gas and avoid them until baby is born. It can also be helpful to eat small, frequent meals instead of trying to get all your calories in three meals a day. Pay particular attention to abdominal cramps in your third trimester. Preterm labor is a serious concern for many moms and your best defense against it is to identify it quickly and see your doctor. When you’re pregnant, other medical problems can crop up that can also cause abdominal cramps. Gallstones, appendicitis and kidney stones can all cause abdominal cramps. These issues may be more difficult to diagnose when pregnant, so it’s important that if you experience any issues, you contact your doctor as soon as possible. If you feel that something isn’t right or you’re struggling with abdominal pain during any trimester, a call to your doctor will help set things right. They’re there to help you identify the cause of your discomfort so you can get back to what you need to be doing: growing your baby.